One day seminar at Green On Red, Dublin. To coincide with framework/rupture I organised this day long seminar at Green On Red Gallery. Ros Kavanagh spoke about the idea of capturing time in photography. Riklef Rambow spoke about the field of Post Occupancy Occupation. Ellen Rowley presented a paper entitled King Kong Architecture, which looked at the history of large modernist buildings in Dublin. Owen Drumm discussed the fundamentals of acoustics as well as some basic techniques for improving the sound of a space. François Chastanet spoke about Pixação, a form of graffiti specific to São Paulo, and specifically the way the letter-forms relate structurally to both the bodies of the writers and the fabric of the city. There was also a screening of The Big Bank, an industrial film which was commissioned by Sisks which documents the process of constructing the Central Bank building. AFTERTHOUGHTS was presented with the kind support of Green On Red. Many thanks to all the speakers for their time and effort. 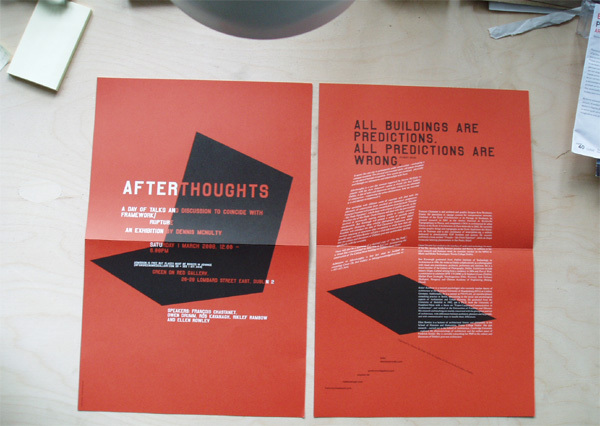 Double sided poster/flyer designed by Peter Maybury.